Fragrance Notes: Grapefruit, Tangerine, Blackcurrant Berries, Pear, Freesia, Muguet Lily of the Valley, Apple, Cedarwood, Sandalwood, Amber, Musk, Praline. 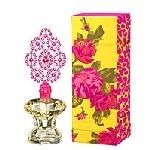 So many people tell me I smell good when I wear Betsey Johnson. I buy another bottle before the other one runs out. I cannot be without it.